High blood pressure is a common condition that affects most people at some point in their lifetime. The condition, which is also known as hypertension, could be caused by eating an unhealthy diet, or by not doing enough exercise. Having high blood pressure puts extra stress on your vital organs, which could ultimately lead to some deadly complications – including heart attacks or strokes. You should speak to a doctor straight away if you notice a tingling in your hands, it’s been claimed. 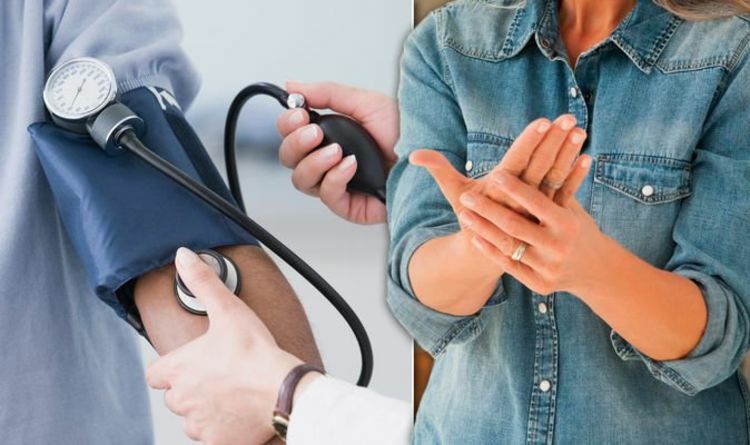 Tingling hands could be an early warning sign of a deadly hypertensive emergency, revealed medical website LiveStrong. The feeling could be mistaken for numbness, and may also develop in your feet, it added. If you develop the symptom, it could be caused by uncontrolled high blood pressure, that could ultimately damage your organs. “When not controlled, blood pressure levels can rise to the point that you start to experience physical symptoms,” it said. A hypertensive emergency could result from uncontrolled high blood pressure, said WebMD. It’s a relatively rare condition, but when it does occur, patients could be at risk of immediate organ damage. Common hypertensive emergency symptoms include headaches, blurred vision, confusion, and seizures. You should speak to a medical professional straight away if you think you’re having a hypertensive emergency. Left untreated, it can cause heart failure, heart attacks, strokes, or even aneurysms. Meanwhile, high blood pressure is often known as ‘the silent killer’, because many people have hypertension without even knowing it. High blood pressure symptoms only tend to reveal themselves if you have extremely high blood pressure, and may include chest pain or severe headaches.